Currently, the incidence of spontaneous regression of squamous cell carcinoma remains unknown and the mechanisms for the same are largely inconclusive. The phenomenon has been observed for a long time. Understanding its underlying mechanisms can help evolve more effective treatments and prove to be a giant leap for modern medicine. Here, we report a case of histologically proven squamous cell carcinoma of the larynx which regressed spontaneously without any treatment. 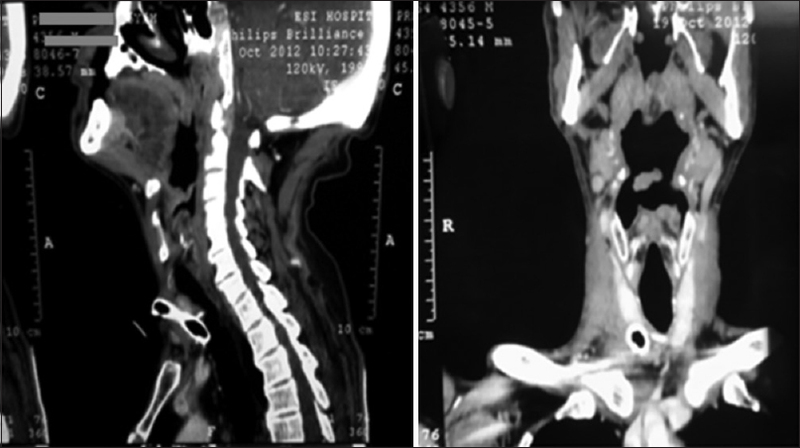 A 66-year-old male patient presented to our casualty (Postgraduate Institute of Medical Sciences and Research/ESI Hospital, New Delhi) in October 2012 with stridor. Emergency tracheostomy was done to secure the airway. 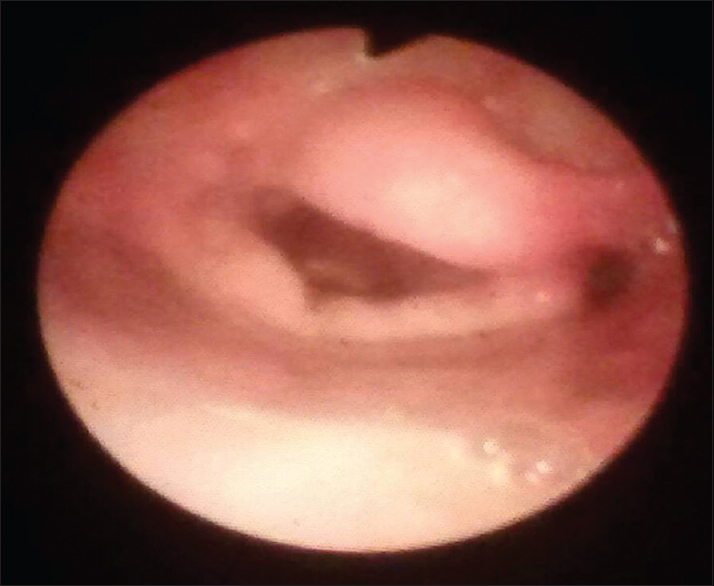 Direct laryngoscopy and biopsy under general anesthesia were performed the next day which revealed an ulceroproliferative growth involving the left vallecula, epiglottis, left pharyngoepiglottic fold, left false and true vocal cords, and aryepiglottic fold. Left true vocal cord was fixed. Multiple punch biopsies were taken and sent for histopathological examination. 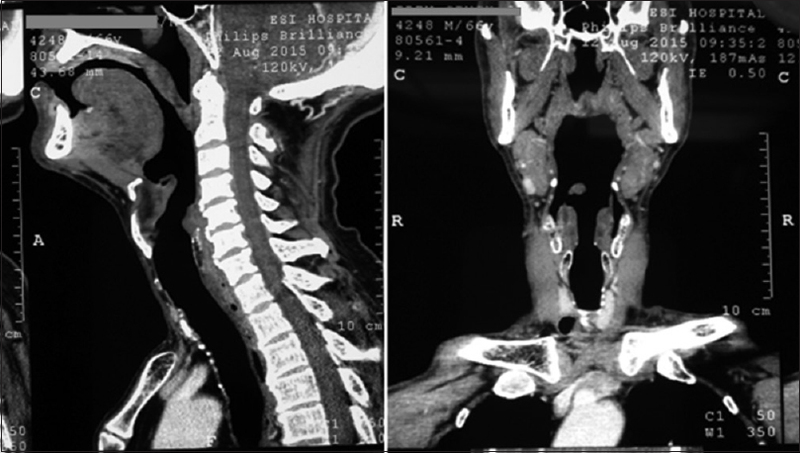 Neck examination revealed a 1.5 cm × 2 cm Level 2 lymph node on the left side which was hard, mobile, and nontender. The histopathological examination reported moderately differentiated squamous cell carcinoma. Contrast-enhanced computed tomography (CT) skull base to diaphragm was done (October 2012) which corroborated the findings of direct laryngoscopy [Figure 1] and [Figure 2]. The lesion was labeled as T3N1M0. The patient was counseled and treatment options were explained. However, the patient and his attendants refused any treatment. Refusal for treatment was obtained in writing. The patient was discharged with tracheostomy tube in situ and advised regular follow-up. In February 2015, the patient presented to the outpatient department with tracheostomy tube in situ with no complaints and in good general health. The patient was still actively smoking and denied taking any sort of treatment including steroids, antitubercular therapy, homeopathic treatment, and naturopathic treatment. The patient is a nonvegetarian and nonalcoholic and denied any unusual change in his dietary pattern. There was no episode of febrile illness or infective disease. Interestingly, the patient went on a popular pilgrim spot on a bicycle (with tracheostomy tube in situ) covering around 800 km including a 14-km steep mountainous climb. 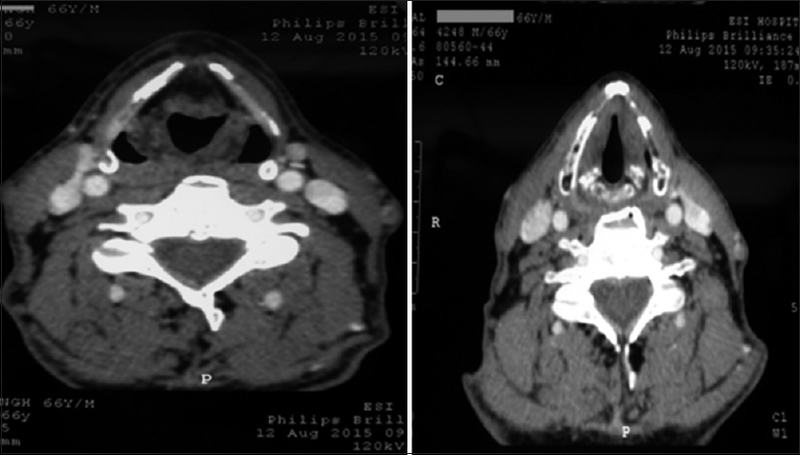 Contrast-enhanced CT skull base to diaphragm was done (March 2015) which revealed a heterogeneously enhancing soft-tissue attenuation involving preepiglottic space, right lateral margin of epiglottis, and right vallecula (1.8 cm × 1.8 cm). Glottis, subglottis, and aryepiglottic folds were normal. 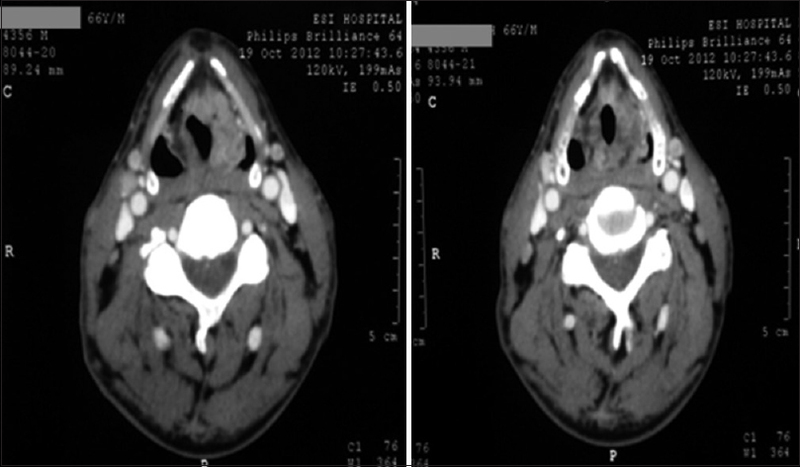 Laryngeal cartilages were normal with no cervical lymphadenopathy [Figure 3] and [Figure 4]. Flexible laryngoscopic examination was performed which revealed edematous/thickened aryepiglottic folds and left side epiglottic defect. No growth/ulceration was noted [Figure 5]. A repeat direct laryngoscopy and a biopsy under general anesthesia were advised which was refused by the patient. Hence, a whole-body positron emission tomography (PET) CT scan was obtained (March 2015) which revealed no metabolically active malignant lesion in the body. The patient was decannulated and discharged in a stable condition. The original histopathology tissue block (October 2012) was retrieved and the same was reviewed at another reputed government medical research institute in New Delhi. The previous histopathology report was confirmed as moderately differentiated squamous cell carcinoma. The patient is alive and healthy with normal speech and deglutition till submission of this report. Furthermore, the patient continues to smoke regularly. The clinical presentation and histopathological findings support the diagnosis of squamous cell carcinoma in our patient. Since squamous cell carcinoma has regressed without any treatment over the 3 years since diagnosis, we feel that it fulfills the criteria for inclusion into spontaneous regression of carcinoma. Although commonly reported in renal cell carcinoma, malignant melanoma, and neuroblastoma, spontaneous regression of squamous cell carcinoma is rare. There are now several hundred such cases of spontaneous regression in the world scientific literature and no one doubts the validity of the observations with reported incidence of approximately one in 60,000–100,000 cases of malignancies. The earliest references of cancer immunotherapy and regression date back to the times of Egyptian Chief Physician Imhotep (2600 BC), who recommended poultice followed by incision of the tumor as a treatment which would result in its infection and therefore its regression. The phenomenon of spontaneous regression is also known as St. Peregrine tumor after a 13th-century monk. Many cases of spontaneous regression may not have been reported by clinicians due to fear of criticism or misdiagnosis. Further, in patients on treatment, spontaneous regression will be attributed to the treatment itself. Some authors define remission as “a temporary amelioration of a condition, to be followed later by an exacerbation” while “in regression, the tumor disappears and the patient is restored to health” while others use the terms interchangeably. The exact mechanism of spontaneous regression of carcinoma is unknown. However, a number of mechanisms have been proposed in different malignancies including immunological, hormonal, infective, surgery or operative trauma, necrosis, or vascular insufficiency. Immunological factors seem to be the most plausible explanation for spontaneous regression of cancer. Spontaneous regression can occur via T-cell-mediated apoptosis. Specifically, MHC Class I cytotoxic T-lymphocytes have been found to have the greatest specificity for cancer cells. Targeting immunotherapies has demonstrated tremendous promise with treating intractable cases. Case reports of cetuximab, a monoclonal antibody targeting epidermal growth factor receptor, has been associated with prolonged survival., More evidence of the role of the immune system is demonstrated following organ transplantation. Immunosuppressed patients show a high incidence of squamous cell carcinoma development and lower rates of regression. A number of cases of spontaneous regression have been directly attributed to infection. Infection incites an increased host immune reaction which, in turn, may increase an individual's defense against a tumor. Unfortunately, however, the precise mechanism of this process is not well understood. In the late 19th century, Dr. Coley of Memorial (now Sloan Kettering) Hospital in New York noted spontaneous regression of recurrent sarcoma following Streptococcus pyogenes-induced erysipelas infection. He assumed that patient's activated immunity in response to the acute infection was the key factor in cancer regression. He developed a vaccine containing two killed bacteria, the Gram-positive S. pyogenes and the Gram-negative Serratia marcescens, popularly called the Coley's toxin. Coley stressed that the ability of the vaccine to induce mild-to-moderate fever was the most important factor in the regression of cancer. Operative procedures conducted on the primary tumor or the metastases have been reported to cause regression in the remaining tumor mass. The removal of a portion of the tumor burden presumably allows the host immune system to destroy the remaining tumor. Operative procedures may also restrict blood and nutrient supplies to the tumor causing the tumor to necrose and die. We present our peers histologically proven squamous cell carcinoma of the larynx which is a rare but spectacular occurrence. The exact underlying mechanisms are unknown at present. Greater understanding of the factors involved may help us in controlling this so-called “irreversible” disease. However, it should be borne in mind that spontaneous regression is not the natural course of squamous cell carcinoma and the disease in any such rare case may recur in time and space. Current evidence mandates active and urgent treatment of the disease, and patients should be counseled and treated as per the latest treatment guidelines. Cole WH, Everson TC. In Spontaneous Regression of Cancer. 1st ed. Philadelphia, PA: W. B. Saunders; 1966. Cole WH. Efforts to explain spontaneous regression of cancer. J Surg Oncol 1981;17:201-9. Thomas L. The youngest science: notes of a medicine watcher. Viking press; 1983 ISBN 0-670-79533-X: p. 205. Penguin books; 1995 reprint ISBN 0-14-024327-5. Hoption Cann SA, van Netten JP, van Netten C, Glover DW. Spontaneous regression: A hidden treasure buried in time. Med Hypotheses 2002;58:115-9. Pack GT. St. Peregrine, O.S.M. – The patron saint of cancer patients. CA Cancer J Clin 1967;17:181-2. Boyd W. The Spontaneous Regression of Cancer. Springfield: Charles C Thomas Publisher; 1966. Mocellin S, Wang E, Marincola FM. Cytokines and immune response in the tumor microenvironment. J Immunother 2001;24:392-407. Kalapurakal SJ, Malone J, Robbins KT, Buescher L, Godwin J, Rao K, et al. Cetuximab in refractory skin cancer treatment. J Cancer 2012;3:257-61. Jennings L, Schmults CD. Management of high-risk cutaneous squamous cell carcinoma. J Clin Aesthet Dermatol 2010;3:39-48. Sindelar WF. Regression of cancer following surgery. Natl Cancer Inst Monogr 1976;44:81-4. Coley WB. Treatment of inoperable malignant tumors with toxins of erysipelas and the bacillus prodigiosus. Trans Am Surg Assoc 1894;12:183-212. Cole WH. Spontaneous regression of cancer; the metabolic triumph of the host. Ann NY Acad Sci 1974;230:111-41. Parbhoo S. Necrosis in cancer tissue. In: Stoll BA, editor. Prolonged Arrest of Cancer. Toronto: JB Wiley & Sons; 1982. p. 243-80.